The legacy continues with Greg Hunter. 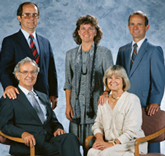 Hunter Industries was founded by irrigation industry pioneer and entrepreneur Edwin "Ed" Hunter with the help of his sons Paul and Richard, and daughter Ann. In 1983, the small Hunter team introduced the PGP gear-driven rotor to the world of irrigation. The proprietary product started what is now referred to as "The Rotor Revolution" in the landscape irrigation industry. Its success as an efficient, reliable product quickly put Hunter on the map as a well-respected irrigation equipment manufacturer. In 1985, with demand growing for the PGP, Hunter opened international distribution channels in Australia and Europe. By 1994 the Hunter catalog grew to include short and long-distance rotors, sprays, valves, and controllers. With the company stable and the future bright, Ed retired in 1994. The next leader of Hunter Industries would be Ed's son Richard, an accomplished engineer and entrepreneur. Throughout the 1990's and into the new millennium, Hunter has grown to become a market leader in residential, commercial, and golf course irrigation system components. Now under the leadership of Greg Hunter, Richard's son, the product line now includes products ranging from rotors that throw between 10 and 160 feet, the water-saving MP Rotator, climate-based irrigation controllers, valves built to withstand 220 PSI, fully modular I-Core controllers, highly popular X-Core residential controllers, the subsurface irrigating Eco-Mat, Professional Landscape Dripline with built-in check-valves, and several robust central control options. Beyond irrigation, Hunter has also recently increased our investment in Hunter Golf, our line of golf course irrigation products, acquired the innovation driven FX Luminaire brand of outdoor lighting, and formed Hunter Custom Molding, which offers our extremely efficient manufacturing services to industries beyond irrigation. While we couldn't be more proud of the products we've introduced over the years, we're most proud of what the Hunter name has come to signify. Throughout all of our interests, Hunter has grown to mean more. More support, more technical resources, more product training, market-stabilizing prices, and generous warranties. Because we understand our customers don't just need a manufacturer. They needed a partner. Today, with four brands under our corporate banner, sales on every inhabited continent, and over 100 unique product lines, the Hunter promise of partnership still stands as strong as ever. And it's exactly how we'll continue to do business moving forward.